Notice the new main menu item at top: CALENDAR. This is something I've wanted for our community for a long time. It is also something many of you have asked for. The goal of the event calendar is to make it easy to find all the posted ride events available this weekend, next week, this month, etc. There is not any integration going on here--it's just a public Google Calendar named "RideForum". I have to manually add events to it. However, I think I can keep up with this easily. As all of you post ride invitations or I otherwise become aware of events, I'll add them to the calendar. If you also use Google Calendar personally, you can add the RideForum calendar to your calendar view so that RideForum events show up in your calendar. I hope this proves useful for many of you. Awesome!! Nice work. I think this will be very useful in the future. Do we PM you if we would like for you to add something to the Calendar? Can people only view this if they are a member? Like the rest of RideForum, the calendar can be viewed by anyone--it does not require login. If an event is worthy of the calendar, it is worthy of a topic post. So I'd like the calendar to be an organic extension of the forum topics. My plan for now is simply as folks post up about rides or other relevant events, I'll add them to the calendar--no need to ask me to add them to the calendar. I am automatically notified of every post to the site and I read every one. When I create the calendar event, I put a link to the topic as the description. This way people can read full details about the event--whatever has been posted--and discuss the event. Thanks, Troy! This is a welcome addition! Thanks, guys! In the calendar, check out the "Agenda" view. It shows all events for the rest of the year in chronological order. This will make is so much easier to find rides and other events. Just post your own events or events you hear about in the forums as normal. I'll pick them up and add to the calendar. you realize that the november 5th date is showing "busy" is that what you meant or is it just hidden to us plain users ? No, I did not realize this. It is supposed to be a public calendar. Should be fixed now. Let me know! Your view should look the same as mine -- can you see the events like this screenshot? BOO HOO! There is nothing on the RideForum Calendar past today! What ride events do you know about? Even if they are way out in 2017, let's get them on the calendar! Here's how you do it...simply create a new post anywhere in the forums and mention the event with enough details for me to add it to the calendar. Doesn't have to be rides--could be any event that might interest this community. Want to add nation wide rally's? Or you want to keep it localish? I want to include any events that have potential interest to our community--even if it's just 1 or 2 folks. National events could meet that requirement. This is good stuff. One thing that i've been struggling with since i've been here is something like this. The Pacific NW is very bike centric so things like this exist all over the place. If I was an HD rider, i'd be fine here, but I ain't, and I ain't gonna be. 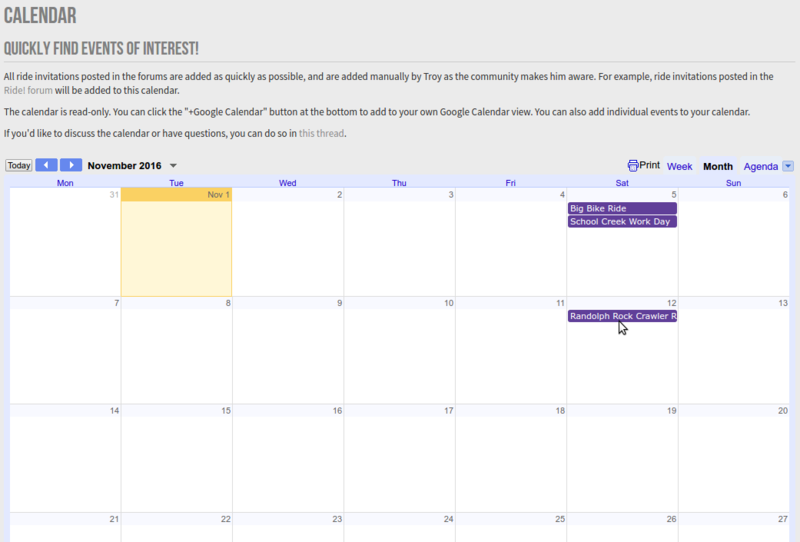 REMINDER: The way events get onto the RideForum.NET Calendar is I go into the Google Calendar and add them. Only I have this "authority" right not. This isn't because I'm a power-hog. It's simply that I don't know how to easily integrate things so people can create their own calendar items. As a software developer, I could code it, but I'd spend many hours on a project like that for very little gain--we don't have enough events going on for it to be burdensome...and I don't have to police it from people like ajayhawkfan posting fake events like "Quilting Club Meeting at Troy's House"
When people post events--whether large regional events or defined weekend ride invites, I pick up on those and pro-actively add them to the calendar. So rather than post an event here in this calendar thread, create a new thread dedicated to the event. I'll see it and add it to the calendar. troy wrote: ........ ajayhawkfan posting fake events like "Quilting Club Meeting at Troy's House"
Forgive me for my mistake. It was a Scrapbooking Club Meeting at Troy's House. Troy, was there a good turnout? Eddie, I am tired of defending my scrapbooking hobby to you. Scrapbooking is fun and creative. It brings friends together where they enjoy fellowship over the common goal of preserving memories in fun & fancy ways that can be enjoyed for many years to come. You don't have to defend it, I'm sorry I missed the meeting. I heard it was a cut up. ajayhawkfan wrote: You don't have to defend it, I'm sorry I missed the meeting. I heard it was a cut up. A "cut up". I see what you did there. You missed a good time--a real page turner.